Introduction: There are two predominant approaches to chronic pancreatitis: ductal decompression and pancreatic resection. At our institution, we have adopted a hybrid approach of preoperative endoscopic pancreatic duct stenting (PDS) with subsequent partial pancreatectomy in persistently symptomatic patients. Therapeutic PDS for chronic pancreatitis is less invasive but, felt to be less efficacious than surgical approaches. There is also concern that it may actually worsen subsequent operative outcomes when performed preoperatively. However, studies on preoperative PDS are scarce and have focused more on biliary stenting prior to pancreaticoduodenectomy for cancer. The purpose of our study was to examine our experience with preoperative PDS in patients with chronic pancreatitis prior to distal or subtotal pancreatectomy. Methods: We performed a retrospective review of all appropriate patients at our institution over a five year period. Results: In total, 91 patients underwent PDS. 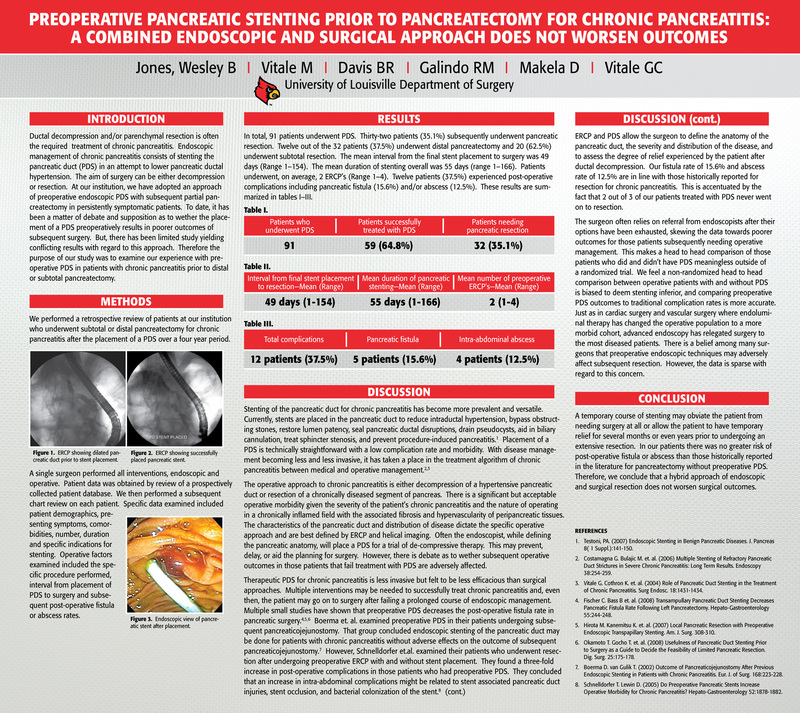 Thirty-two patients (35.1%) subsequently underwent pancreatic resection. Twelve out of the 32 patients (37.5%) underwent distal pancreatectomy and 20 (62.5%) underwent subtotal resection. The mean interval from the final stent placement to surgery was 49 days (Range 1-154). The mean duration of stenting overall was 45 days (range 1-166). Patients needed on average 2 ERCP’s (Range 1-4). Twelve patients (37.5%) experienced post-operative complications including pancreatic fistula (15.6%) and/or abscess (12.5%). Conclusions: We conclude that a hybrid approach of endoscopic and surgical techniques does not worsen surgical outcomes and PDS as a preoperative approach to chronic pancreatitis is successful in 2 out of 3 patients.